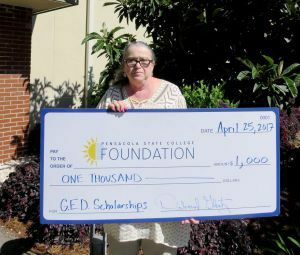 Pensacola State College students in the General Education Development program will have more scholarship opportunities, thanks to a $1,000 gift honoring James “Jim” Glantz who taught GED classes from 2002 to 2011. Deborah Glantz made the donation in memory of her late husband who was committed to his students and taught until a cancer diagnosis forced him to leave the classroom. As a sober member of Alcoholics Anonymous for 39 years, Jim was also a committed volunteer for Pathway for Change and lived out the importance of giving back. “His love for teaching and his passion for paying it forward will be honored through these scholarships awarded to GED students who are also in recovery programs and are actively rebuilding and improving their lives,” Deborah added. Jim Glantz’ first career was serving in the U.S. Navy for 30 years and retiring with the rank of Master Chief. After earning his associate degree at Pensacola State, he earned a bachelor’s degree in education at the University of West Florida. Then, he taught computer programming at St. Benedict School in Elberta, Alabama in addition to his teaching career at Pensacola State. Deborah Glantz also is a Pensacola State alum and said that a certification she earned at the college significantly impacted her life. “I worked for the Navy for 22 years as a Certified Addiction Professional and my career started at then Pensacola Junior College,” Deborah said. Hillary Person, PSC Foundation director of development and campaigns, said the Foundation is fortunate to receive the support of so many community members. “Every scholarship gift, no matter the amount, to the college’s Foundation is transformational to the lives of our students,” Person said.